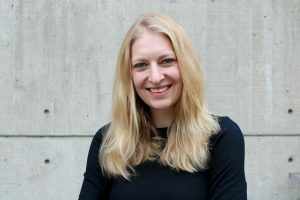 Caitlin Cieslik-Miskimen is a doctoral student specializing in media history. Her dissertation examines the historic role print culture played in shaping community identity in the early 20th century, and her research interests include topics related to mass culture, sports communication, education, and memory. She earned her M.A. in journalism from the University of Wisconsin-Madison, and her thesis examined the way newspapers in small cities mediated mass culture in the early 1920s. She received her B.A. in journalism and French from the University of Wisconsin-Madison. Previously, she worked at as an account manager for a public relations agency specializing in energy technology, and also has experience as a multimedia sports reporter. Caitlin has a strong record teaching upper level media theory and history classes, and has earned several honors for her commitment to undergraduate education.